The Falls Recreation Center is located a short distance from the clubhouse and is a full-service, comprehensive, one-stop facility for golfers. 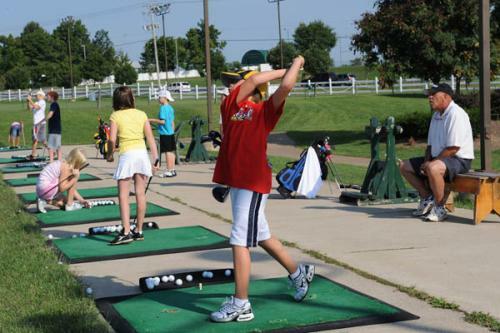 Our facility offers everything a golfer needs to practice and improve your golf game. The Falls and its staff will provide you with the tools to reach your goals. Not only do we provide instructions, but clarify the process of improving your golf game using proven teaching techniques, instructions, drills, video and motivation. The Falls knows it is difficult to learn the game if you don’t have someone to encourage you to succeed. We provide that support to every student, which is needed for maximum improvement. The Falls Golf Club has a number of PGA Golf Professionals to help students learn the game and lower their scores. Be sure to talk to one of our Professionals about getting a personalized Player Evaluation. This is a great program to help decide whether a player needs only a few tweeks in your game, a series of lessons or equipment changes. For more information regarding lessons please contact us via email or fill out the short form below and we will get back to you promptly. The Falls Recreation Center offers many types of junior programs. To start, we have after school camps in April, Junior golf summer camp in June, junior learning memberships, and junior leagues. Most programs run in the summer and ends in August. We have programs for every junior whether just starting out or looking to play for a high school or college team. Want to be part of a winning group, then join one of our many golf clinics offered by The Falls Recreation Center staff. We have group clinics for ladies, mixed, and men. These and other programs are great for beginner, intermediate, and seasoned players alike. Call us to find the best group instruction program for your needs and ability. For more information regarding group lessons please contact us and we will get back to you promptly. We provide excellent personal attention and concern for the improvement of your game. Many different packages are available to suit your needs. The Falls Golf Club has many Golf Professionals that can help lower your score. The Falls Recreation Center offers discounted range cards that allow you to purchase practice buckets of your choice at a discounted rate.